Walds Ordnung [s.l. : s.n. ], 1535. Walds Ordnung is the first edition of revised legislation regulating forest and land use rights in the Nuremberg forests. 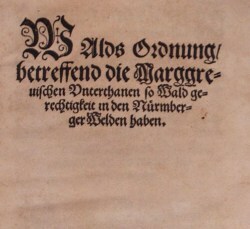 The original forest and land use rights for the subjects of the Margraves Brandenburg-Ansbach and Brandenburg-Kulmbach had been regulated by agreement in 1496, but after conflicts in the early sixteenth century, the arrangement was modified and re-established. Set forth in Walds Ordnung are basic forest rights, followed by explanation of community usage, such as using firewood, removal of firewood, and grazing rights, with stated penalties for violations. With nineteen unnumbered leaves in quarto format, this work includes a large folding woodblock plate depicting the length of the old “Kettenmass” land-chain measure. Its contemporary vellum binding consists of an antiphonary leaf with illuminated letters in red, green, and brown, lacking ties. The hand-painted arms of Rieter von Kornburg, dated 1609, are affixed to front pastedown. No other copies are recorded outside Germany.